A clearly visible and accurate civic address sign, in vivid, bold lettering should adorn every home. During an emergency when every second counts, it is reassuring to know that first responders will locate you thanks to your luminescent civic address sign. 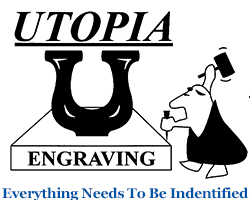 UTOPIA ENGRAVING of Phoenix, Arizona, makes many different types of quality identification signs, including name badges, directional signs, desk signs, and more. We have been supplying quality signs since 1984, guaranteeing dependable service at reasonable prices. 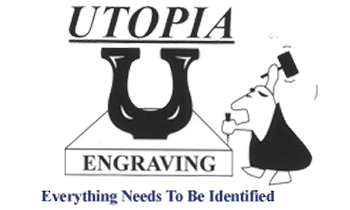 We will exceed your expectations and we stand behind our work, proudly made in the U.S.A.
Order a highly visible address sign from UTOPIA ENGRAVING and never worry again about not being located by delivery trucks, taxis, or important visitors, the fire department, police department, ambulances, and all emergency responders. 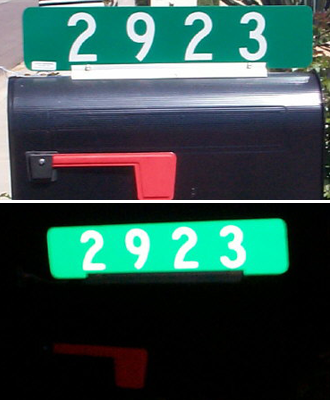 Our signs are highly reflective and allow for prompt identification of your property during day or night. 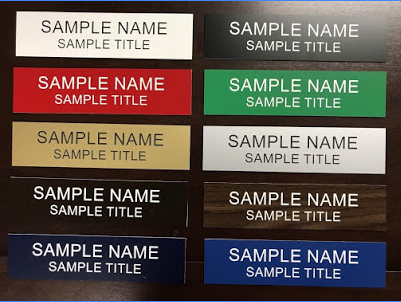 2" x 8" Engraved deskplates with aluminum holders. Multiple styles and colors are available to choose from! Make sure your house can be found day or night.